It seems a fair bet that Chris Ashton hasn't enjoyed the last couple of weeks. He was called a 'pretty winger' by Digby Ioane, had the description rejected in cheerfully insulting terms by team-mate Toby Flood, missed an England match through suspension and was then on the losing team on Saturday. Any thoughtful friend will then have steered him away from replays of the Italy v All Blacks match in which Julian Savea took his international tally to 10 tries in seven matches. Ashton, who was honest enough to admit to envy when watching Charlie Sharples running in a couple against Fiji, can remember when he seemed to score every time he ran on to an international field. Those memories are receding, since it is now 10 matches since he scored for England. Wingers are like strikers in football. Scoring isn't their only role, but it is the one in which they are likeliest to be judged and, as is clearly the case with Ashton, judge themselves. There's good reason for this, since they are by far the likeliest scorers on the field. Since 1884, the earliest date for which our Statsguru archive records separate wingers, there have been 17,168 appearances by wingers, including 1,385 as replacements. Between them they have scored 6,209 tries, roughly one every two and three-quarter appearances. That compares to the average of once in every seven and a half appearances for all players. Only centres, with a try in every 5.4 appearances, score at even half the rate of wingers. Props, once in every 22, are the least likeliest scorers, while number eights, with a score in every 7.4 appearances are likelier to score than outside- (8.1) or scrum-halves (8.6). England wingers have claimed 502 tries in 1296 appearances, an average slightly over once every 2.6 appearances. All Blacks cross at a rate of better than one in two (543 in 1063), rising to just over one in 1.6 (290 in 469) since the professionalism was accepted in 1995. So Ashton's anxiety is understandable. Over a 10 game period the average England winger - never mind one with perfectly reasonable aspirations to be considerably better than that - might hope to score four tries. But his career record, 15 tries in 27 matches for England, remains eminently respectable, and he is hardly alone as a high-class finisher experiencing a period in which he stops finishing. Best known to him will be his erstwhile team-mate Mark Cueto, who went 18 matches without scoring between 2009 and 2011. Cueto's contribution in other ways was sufficient to keep him in the team and he finished with a career tally of 20 tries in 56 matches, barely below the English average. This week will bring back older memories, of Olympic sprinter Ken Jones and his winning try the last time Wales beat the All Blacks in 1953. Less remembered is that it was the last try in an international career that still had 13 matches to run. "Scotland are rightly delighted to have found a serious wing threat in Tim Visser. But whether, given access to a time machine, you'd choose him ahead of an at-his-peak Roger Baird is open to question"
Wales's under-use of Jones was much reported at the time, but when centre Gareth Griffiths attempted to remedy this deficiency in a match against Scotland he found that Jones was hardly chafing at his previous underemployment :"For f**** sake, Gareth, either kick it or have a go yourself" was the instruction during a break in play after Griffiths had fed him several times during the opening exchanges. Ashton's run, like that of Cueto and Jones, looks like a blip in an otherwise highly productive career. There are, though, other players who, far from stopping scoring, never got started. The all-time record-holder in this respect is Salvatore Perugini, who played 83 matches for Italy without scoring. Among backs from established nation, the champion is Sir Ian McGeechan, who appeared 40 times for Scotland and the Lions without crossing the opposition line (although he did drop eight goals). Among wingers, the record-holder is Ludovico Nitoglia, who played 17 times for Italy without scoring. Not far behind is Clive Rees, a distinctly lively operator from London Welsh who still contrived to make 13 appearances for Wales between 1973 and 1983 - and get picked for the 1974 Lions tour of South Africa - without scoring. Most famous non-scoring winger of the lot was Roger Baird of Scotland. He played 27 times for his country, and went on the 1983 Lions tour of New Zealand, playing in all four tests. 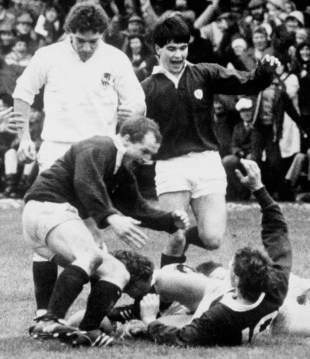 The only time he touched down was for the Lions at Dunedin, playing in a team in which Scotland, with five starters and three replacements, was the most represented of the home nations. Yet, as his place in the Lions test team shows, there were few doubts about Baird's quality. He played in Scotland's 1984 Grand Slam team and in the epic 25-25 draw against the All Blacks the previous December. He initiated perhaps the best Scottish try of that period, his superb counter-attacking run from Gareth Davies's misjudged kick at Cardiff in 1982 starting a length of the field attack finished by Jim Calder. Closer examination of the five Five Nations seasons (1982-6) in which he was a nailed-on choice provide some clues to his scorelessness. This was not a period of high-scoring wings, with only Patrick Esteve (8) and Trevor Ringland (7) crossing more than four times. The Scots were not short on creativity. Roy Laidlaw and John Rutherford were one of the best half-back pairings in their history. But their style of play produced a highly distinctive scoring pattern. Scottish wings scored fewer tries, four, than those of any other team across those five campaigns. But the remainder of the team claimed 27, more than the non-wings of any other team. Laidlaw was the leading scorer with five, followed by Rutherford and number eight Iain Paxton with three. Baird may not have scored as often as Trevor Ringland, but he played in more winning teams (10 from 19 matches to the Ulsterman's eight) over the same period. Peter Steven played four matches for Scotland in 1984 and never scored, but didn't finish on a losing team. Scotland are rightly delighted to have found a serious wing threat in Tim Visser. But whether, given access to a time machine, you'd choose him ahead of an at-his-peak Roger Baird (ideally, of course, you'd want both) is open to question. As Ashton, a decent defender and superb runner of supporting lines, is doubtless hoping Stuart Lancaster will be keeping in mind this week, the non-scoring winger also has his uses.